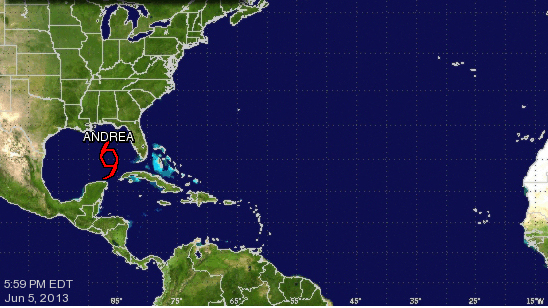 Andrea, First Named Storm Of 2013 Hurricane Season, Forms In Gulf : The Two-Way Forecasters expect Tropical Storm Andrea to bring heavy rains to Florida before moving up the East Coast in the coming days. It is the first named storm in what is expected to be a busy hurricane season. The National Hurricane Center is tracking Tropical Storm Andrea, currently in the eastern Gulf of Mexico, on its website. Tropical Storm Andrea, the first named storm of the new hurricane season, has formed in the eastern portion of the Gulf of Mexico. Forecasters expect the storm to bring heavy rains to Florida before moving up the East Coast. The National Hurricane Center announced the development Wednesday afternoon, as it issued a tropical storm warning for Florida's western coast from Boca Grande to the Ochlockonee River. A tropical storm watch is in effect for the next two days for a broad area between Flagler Beach, Fla., and Surf City, N.C. The center is updating a map on its website, showing Andrea's position. As The Two Way reported last month, "The National Oceanic and Atmospheric Administration believes that this year, there is a 70 percent chance of 13 to 20 named storms, with winds of 39 mph or higher, of which seven to 11 of them could become full-blown hurricanes, with winds 74 mph or higher." The North Atlantic hurricane season runs from June to the end of November.